Since the summer of 2013, he's been trying to find a path to a pot of gold after a contract in the Hoboken Housing Authority was terminated. He accepted the loot that came with an early termination option in the contract and promptly cashed the check. Then he came back hungry for more. This time it's the regurgitation of his "Ethnic Cleaning" civil suit in federal court. Based on yesterday's report on Grafix Avenger, strike up the old Elton John tune "Bennie and the Jets" and insert "Carmelo and the Feds." Many have been awaiting action by a different federal agency. If your frivolous lawsuit fails, try, try again. That's what it looks like as Carmelo Garcia rides out his contingency wave on the back of Louie Zayas, who never lets a Hudson County municipal termination opportunity pass him by. The Hamburgler is back? Munch, munch, munch. Mister Carmelo who ran for sixth ward council and was crushed by Council President Jen Giattino even as undetermined votes were lost when a favorable district election machine went down on Election Day is back for shakedown attempt numero tres. In late 2013, the original Carmelo Garcia "Ethnic Cleansing" lawsuit was thrown out of court. Talking Ed Note: It's embarrassing to watch but this is the political culture in Hoboken and Mister Carmelo is going to give Hoboken and Hudson County a lesson on how it's done. Shame is not part of the personal vocabulary; shamelessness is however an intrinsic function. No one has seen sight of Mister Carmelo's campaign NJ ELEC report. No one knows how much he raised (or funneled) and spent. We do know that he spent at least some of his campaign fundraising on McDonalds. 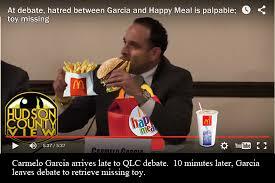 Apparently, Mister Carmelo is quite fond of the Happy Meal.